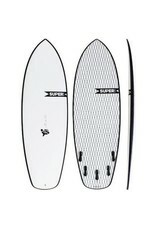 Mål: 20 1/4" 2 9/16"
THE WORLD’S BEST HIGH PERFORMANCE GROVELER - NOW IN SUPERFLEX! 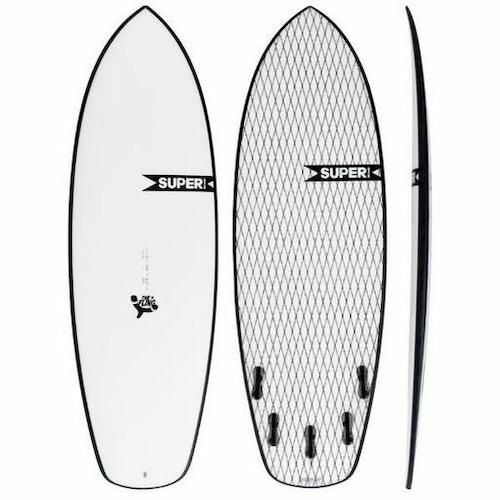 Designed as a shorter and more modern/high performance take on the keel fin fish, it has all the grooviness of the throwbacks with none of the weird oldness. It’s young, rad, and classy all at the same time. Crazy fast down the line, lots of lift, smooth and tight through carves, and progressive in the pocket. It’s versatile: it can be surfed assertively off the tail, or with light feet for those that love airs. About SUPERflex technology: Instead of relying on a wood stringer, SUPERflex uses a lively stringer-less EPS core. Wrapping this: 4 different types of reinforcements going in 6 different directions so that all the flex and strength is engineered into the surface of the board. The result is a consistent feel tip to tail, rail to rail and allows the board to flex naturally with the contours of the wave and in response to applied pressure from the surfer, all while creating a spring back feeling when coming out of turns. Learn more about SUPERflex here! Wave Size: 1-4’ Best Performance: 1-2’ Ability/Experience: Beginner to expert Rocker: Low modern rocker Rails: Full boxy Outline: Super wide Bottom: Single to deep double with vee off the tail Tail Shape: Wide rounded diamond Fin Setup: 5fin FCS2 Construction: SUPERFlex Surfboards do not come with fins.